You may have seen flower frogs in antique stores or at flea markets. 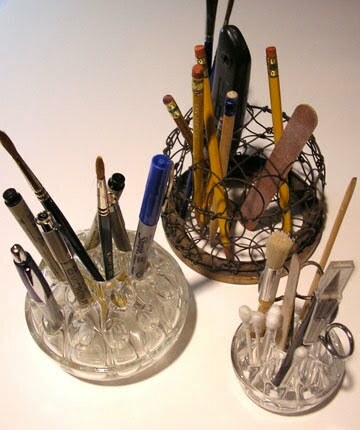 They are traditionally used in vases to hold flowers in place, but how about a pencil holder? There are so many different kinds and colors – wire, green glass, clear glass – that they can go with any decor. Check out the picture below and keep an eye out when you are antiquing.